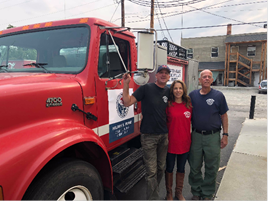 Washington Lands Commissioner Hilary Franz delivers a surplus fire engine to the Riverside Fire District at the Omak Stampede. Rural fire departments in Washington are fighting wildfires this season with tools passed down by the state Department of Natural Resources. Ten districts and departments are receiving surplus fire engines used exclusively for fighting wildfires. They include four fire districts in Stevens County and three in Okanogan County. This is the second year for the program. DNR gave away 19 fire trucks last year. Fire districts and departments are eligible if their county’s median household income is below the state average. Before DNR was authorized by the legislature last year to give older engines to rural districts, the apparatus were sent to other fire agencies. Many old DNR fire rigs have seen plenty of action this year. As of July 31, agency firefighters responded to nearly 900 wildfires which have burned 113,000 acres. In all of 2017, it responded to about 50 fewer fires.